Music in the Mountains will hold Cocktails with the Conductor on April 8 at Sorrel Sky Gallery. Music in the Mountains will entice puzzle solvers with its exclusive music-themed escape challenge at the beginning of June, and teams are forming now. I know spring just started, but summer will be here before you know it. And one of the highlights of summer is Music in the Mountains. The classical music festival has two fundraisers coming up that help it offer a cornucopia of delights during the season and support its Music in the Mountains Goes to School program. 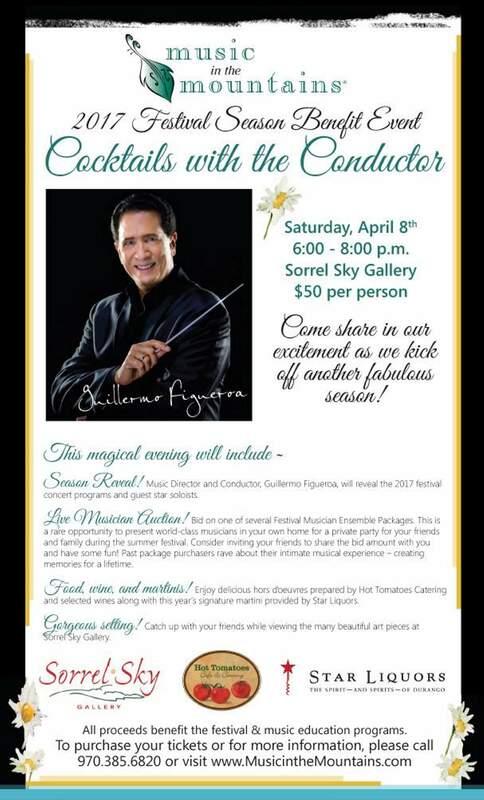 At 6 p.m. April 8, Cocktails with the Conductor will be held at Sorrel Sky Gallery. It’s a chance to get the first look at what will be coming this summer – anticipation is part of the fun – and socialize with Maestro Guillermo Figueroa. The evening includes goodies prepared by Hot Tomatoes, and selected wines and a specially created martini will be provided by Star Liquors. And for those who want to hold a special gathering this summer, several musicians, both longtime favorites and newcomers, are donating their talent to be auctioned off at this event. Many hosts pool their money to purchase the entertainment and food and libations. These private concerts are among my favorite events. Last summer I had the pleasure of hearing pianist Aviram Reichert and oboist Erin Hannigan at the home of Katy Freiberger and Lawrence Althouse. It’s such an intimate lovely party with musicians we normally see on stage. The packages available include: Musical Whimsy, with Sarah Frisof, flute, Philip Kramp, viola, and Anne Eisfeller, harp; Generations, featuring the mother-daughter duo of Heidi Itashiki and Chloe Trevor; Ornate 88, with pianist Andrey Ponochevny; the Cezanne Quartet, Eleanor Dunbar and Lauren Densinger, violin, Steven Juarez, viola, and Elizabeth White, cello; the Latta Mac Jazz & World Music Duo with Jonathan Latta and Chad MacCluskey on guitar and bass; and Russian Riot – the inimitable duo of violinist Oleg Sulyga and violist Dmitry Kustanovich have roped in compatriot violinist Aleksandr Snytkin for a performance that promises to live up to its name. Tickets to Cocktails with the Conductor are $50 and are available by calling 385-6820, visiting www.musicinthemountains.com, or dropping by the festival office at 1063 Main Ave. This is definitely an event where you want to get your ticket in advance. The second fundraiser will also require some advance planning. 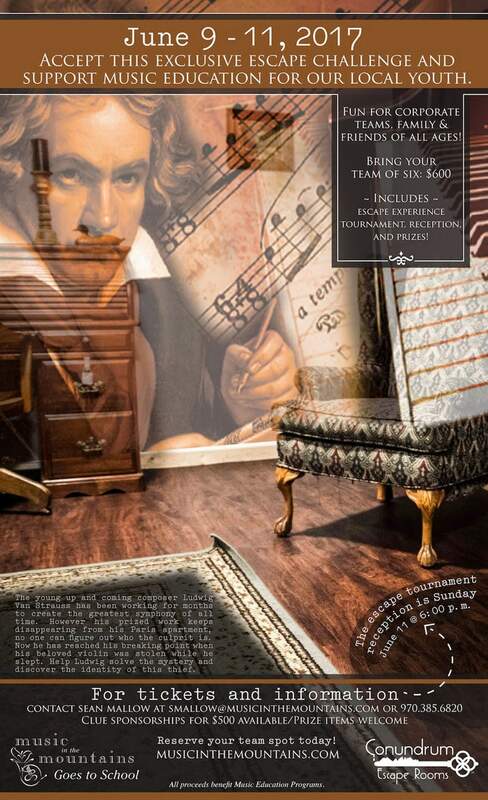 From June 9 to 11, teams of six will attempt to find Ludwig Van Strauss’ stolen violin in a 45-minute experience created by Conundrum Escape Rooms. This will be fun for multigenerational families, corporate teams, groups of friends ... any six people who want to work together and solve an intriguing puzzle. More than just bragging rights are involved – prizes and a reception at the end of the weekend are also included. Music in the Mountains is also looking for clue sponsors and prizes, so contact Sean Mallow at the number above if that is something you want to support. H H H Check back at durangoherald.com for more Neighbors stories and photos. Click on the word “Neighbors” to make sure you haven’t missed any stories. Neighbors runs in the weekend edition of The Durango Herald.Here’s how to reach me: neighbors@durangoherald.com; phone 375-4584; mail items to the Herald; or drop them off at the front desk. Please include contact names and phone numbers for all items. Follow me on Twitter @Ann_Neighbors.I need photos for all Neighbors items, but they must be high-quality, high-resolution photos (at least 1 MB of memory) and include no more than three to five people. I need to know who’s who, left to right, and who to credit with the photo. Candid photos are better than posed, and photos should be submitted as JPG or TIF attachments.